I bought three 20% off iTunes $100 gift card and thought I put it to good use in iBooks store. The Selection was my first book purchase. Look at the beautiful cover/dress. “Don’t judge a book by its cover” but I just could not help it. 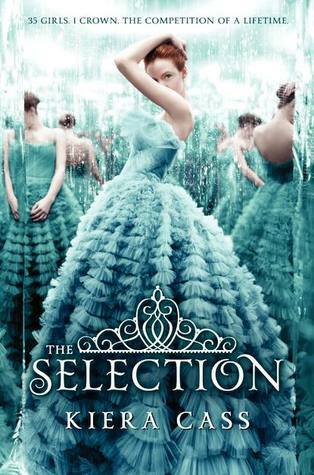 The Selection is the top popular book for the month of April and I want to see for myself what is the hype about it. Mash-up between “The Bachelor” and “Hunger Game” with a little hint of Cinderella would be a suitable summary for The Selection. Thirty five girls raced to the top to be the wife of a prince. Don’t expect any new idea from this book and it’s full of cliche. The USA we all known no longer exists after World War III and World War IV. A new world “Illéa” was created with caste system in place. America Singer, the protagonist, was from Five was in love with a boy, Aspen from Six. Due to his pride and cowardice, he pushed America away. With heart broken, America headed to the Selection. She didn’t prepare to befriended the prince, Maxon and ended to be one of the Elite. She was split between Aspen and Maxon but eventually I can tell that she was beginning to see the opportunity she was given to make a change to the world and her love life seems minuscule compared to the challenges the country will be facing with all the rebels attack. If I have to pick a team, I am definitely on team Maxon. He knew what he wanted and intrigued by America since the beginning even though America has nothing to offer with her status of Six. The initial interactions between America and Prince Maxon were funny. She yelled at him the first night she was there. She kicked him in the groin when she thought Maxon was trying to kiss her. I have a bone to pick with this book. Who would leave a huge cliffhanger at the end with no promise of the next book? This is supposed to be a trilogy? It became a big turn off for me personally. As I was reading through the news about this book, I came upon that this book would be made into a TV series. Seriously?